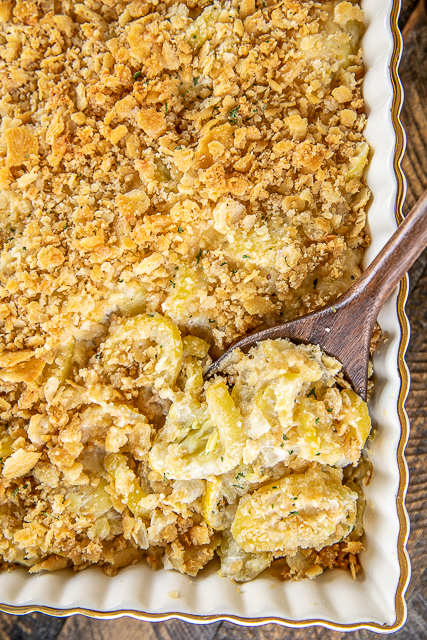 This Old School Squash Casserole is a must at our holiday table. 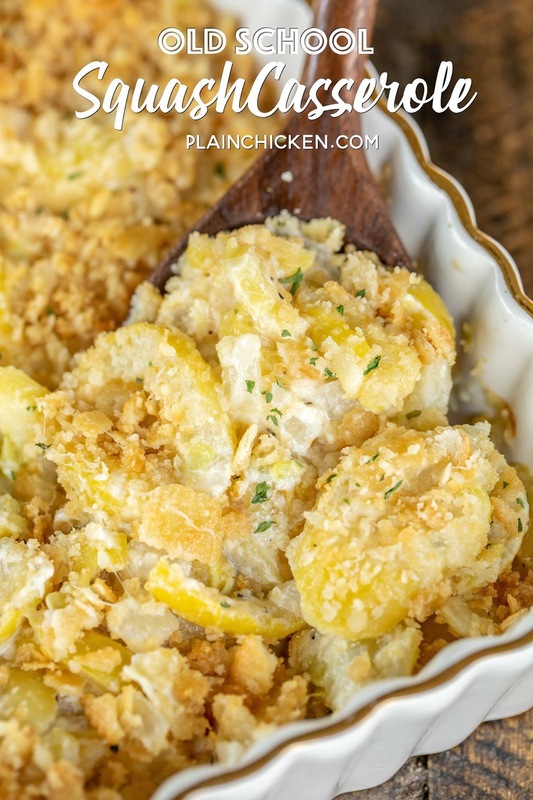 Everyone loves this easy make-ahead side dish! 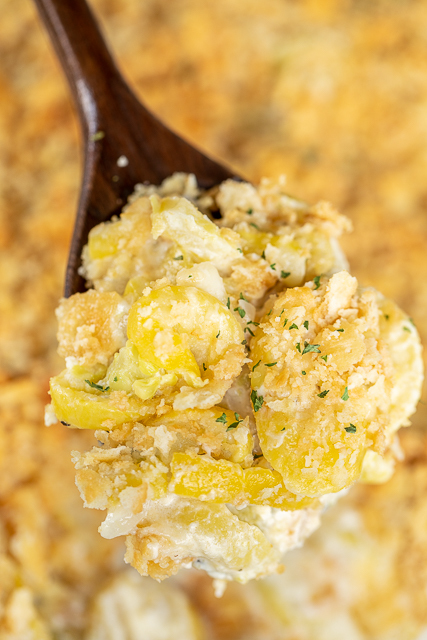 I think my favorite part of the whole casserole is the three cheeses - cheddar, swiss and parmesan. YUM! 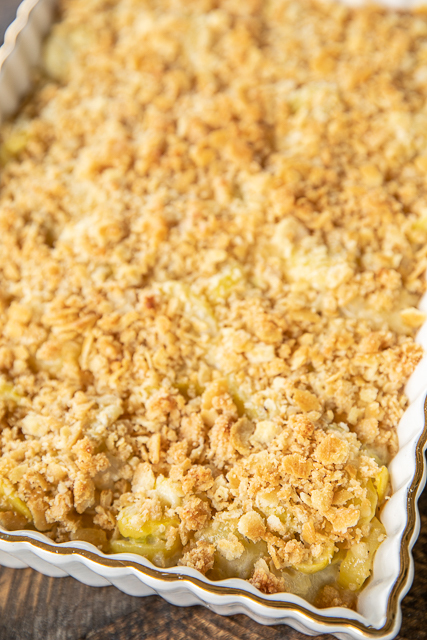 You can make this Old School Squash Casserole a day in advance and refrigerate it overnight. I think make-ahead recipes are a must for the holidays! Nobody wants to spend all day in the kitchen. You want to be able to spend time with your family and relax. The most important step in this recipe is to drain the onion and squash after cooking. You want to make sure as much of the liquid is removed before adding the rest of the ingredients. If you don't drain the cooked squash, the casserole will be too runny. 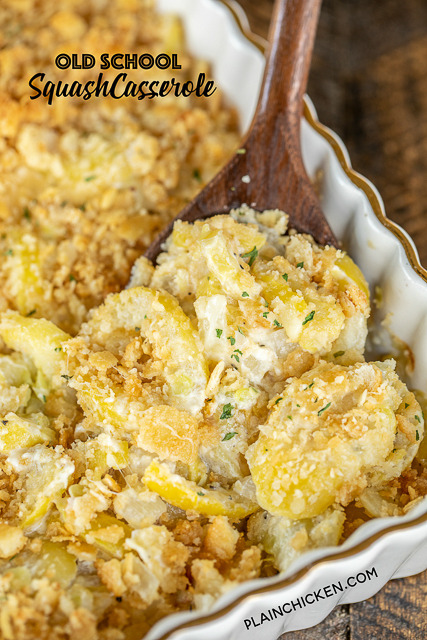 We love this Old School Squash Casserole! It is so simple to make and tastes great!! It will make a great addition to your holiday meal. Preheat oven to 350ºF. Lightly spray a 9x13-inch baking dish with cooking spray. Set aside. Melt 3 Tbsp butter in large skillet over medium-high heat. Add squash and onion and 1 tsp salt. Cook until squash is tender, about 10 minutes. Transfer squash mixture to a colander and drain for 5 minutes. Discard any liquid. Mix together eggs, sour cream, cheddar cheese, Swiss cheese, mayonnaise, thyme, remaining 1 tsp salt and pepper. Add cooked squash mixture. Pour squash mixture into prepared pan. Melt remaining 3 Tbsp butter. Combine crushed Ritz crackers, melted butter and parmesan cheese. Sprinkle over casserole. Yum! I always welcome a good squash casserole recipe.